Yanukovych's ex-cronies paid 152mn hryvnia to the budget. The money that members of the criminal organization of Viktor Yanukovych paid to the budget will be distributed among the families of all those killed in the war and the families of the Heroes of the Heavenly Hundred, the chief military prosecutor Anatoliy Matios told a briefing in the Verkhovna Rada on 20 February. 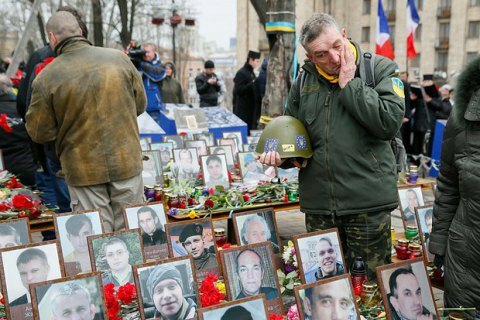 According to Matios, 106 families of the Heroes of the Heavenly Hundred and 3150 families the military and volunteers who were killed in the ATO will receive a one-time payment of 46 thousand hryvnya. He said the Rada's budget committee has supported the initiative of the Prosecutor-General's Office. The money to be used on payments has been paid to the budget by the former Deputy Minister of Economy Oleksandr Suhomlyn (22mn hryvnia) and a former deputy chairman of the State Tax Service Andriy Holovach (130mn hryvnia). The former officials made a deal with the investigation and testified against Yanukovych in exchange for suspended sentences. "They pleaded guilty and gave testimony against the leadership of a criminal organization headed by the former president. They also have paid 152mn hryvnia to the state budget," Matios said. He said that the Cabinet will shortly take the final decision on the payments.